1.5 day classroom, or three 4-hour sessions, or online: Preview the workbook immediately! The nature of business communication has changed dramatically. In a given day, you may be required to speak with team members, supervisors, and customers located in different cities, states, and perhaps countries. Technology continues to increase our level of connectedness, yet the amount of face-to-face interaction is decreasing. As a result, your communication skills are crucial. Effective communicators not only express their own thoughts and ideas with conviction, but they are also engaged and attentive listeners. As such, your ability to send clear, concise messages and listen well can mean the difference between successful business relationships and lost productivity. 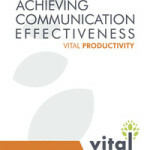 The Vital Learning Achieving Communication Effectiveness™ course is designed to enhance and improve interpersonal skills. 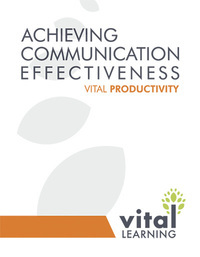 It provides the tools needed to function more productively through improved communication skills. After building a shared awareness of the value of effective communication, participants learn how to develop clear, concise messages that give them credibility, help them persuade and influence others, and increase their efficiency by avoiding self-defeating behavior. Click the “e” to immediately enroll and begin the Achieving Communication Effectiveness online course.